More holiday fun than humanly possible! 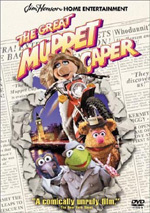 Despite the demise of main man Jim Henson way back in 1990, the Muppet franchise continues to roll into the 21st century. This brought us a new holiday offering via 2002’s It’s a Very Merry Muppet Christmas Movie. From what I can tell, this flick originally aired on TV, and it now makes its home video debut. At the start of the flick, we find a very despondent and glum Kermit the Frog (voiced by Steve Whitmire). He feels hopeless, and an angelic accountant named Daniel (David Arquette) takes notice of this. When miracle worker Glen (William H. Macy) states it’s against the rules for them to help, Daniel takes his case to “the boss” (Whoopi Goldberg). He pleads his case, which then sends us into a flashback to find out what happened. We see the preparations for the big Muppet Christmas show and learn that theater owner Rachel Bitterman (Joan Cusack) will foreclose on the joint if the Muppets don’t pay her big bucks by Christmas Eve. Kermit figures that if the gang defer their salaries, they’ll raise the requisite bucks; reluctantly, the Muppets agree. However, Bitterman conspires to undermine the Muppets with the unwitting help of a love struck Pepe the King Prawn (Bill Barretta). Things go from bad to worse, and when Kermit declares that he wishes he’d never been born, Daniel gets sent to intervene. Hmm... where have I heard that plot before? 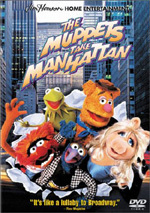 Yeah, Muppet borrows liberally from It’s a Wonderful Life, but it’s not the first and won’t be the last. At least it takes some fun liberties with the source, though Muppet seems less consistent than I expect from these characters. Somewhat surprisingly, the Wonderful Life elements offer the movie’s strongest parts. The sections that lead up to that plot seem pretty erratic. Some good gags emerge – such as Sam the Eagle’s use of Propecia – and the movie seems reasonably fun, but it definitely drags at times. One major misstep occurs via a long and pointless spoof of Moulin Rouge that really goes nowhere. It’s loud and splashy but makes no point. However, once the Wonderful Life theme really kicks into gear, the movie becomes more enjoyable. These parts start when the flick casts Fozzie as Uncle Billy. Naturally, someone has to lose the money meant to pay Bitterman, but whereas Uncle Billy does this due to his own incompetence, Fozzie comes upon a seemingly never-ending set of obstacles. These become clever and creative, with a very fun spoof of the live-action Grinch movie. After that, as Kermit roils in his own depression, we go to the “I wish I’d never been born” segment, and that also offers many amusing touches. Some of these become shockingly surreal, such as a club sequence in which Scooter dances in a cage to a song that strongly resembles Nine Inch Nails’ “Closer”. While the Muppets can be slightly edgy at times, I never quite expected to see that! Add to that hilarious reworkings of the main Muppets – such as a delightfully altered Beaker – and the fantasy parts offer some solid humor. Too much of It’s a Very Merry Muppet Christmas Movie fails to live up to that level, so I can’t call the flick a real success. It also makes some unfortunate missteps with a stereotypically gay choreographer, an element that seems out of place in the Muppet universe. Even at a mere 88 minutes, the movie feels a little long and padded. Still, it gets in some good gags and ends well, which means that it provides a reasonably entertaining flick that should be moderate fun for adults and kids alike. 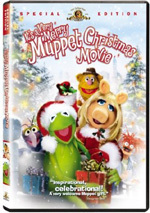 It’s a Very Merry Muppet Christmas Movie appears in an aspect ratio of 1.33:1 on this single-sided, single-layered DVD; due to those dimensions, the image has not been enhanced for 16X9 televisions. As one might expect from a recent production, Muppet presented a very strong picture. Sharpness looked great. Softness demonstrated no problems throughout the flick. Instead, it remained nicely detailed and well defined at all times. I saw no concerns connected to jagged edges or shimmering, and the image also seemed to be free of edge enhancement. As for print flaws, I noticed none. The picture looked clean and free from defects. Colors offered a strength. The movie offered a lot of bright and vibrant hues, and the DVD made them all look great. The tones were lively and dynamic and showed no signs of noise, running, or other issues. Blacks were dense and deep, while low-light shots looked concise and nicely defined. Overall, the image of Muppet was quite strong. Though acceptable for this sort of flick, the Dolby Digital 5.1 soundtrack of It’s a Very Merry Muppet Christmas Movie seemed pretty ordinary. The soundfield strongly favored the front channels. They offered decent stereo music and some mild spread to the sides for effects. Those elements demonstrated occasional examples of movement and panning and created a fair sense of environment. The surrounds mostly echoed the audio from the front, as they didn’t offer much to add to the setting. Audio quality appeared satisfactory. Speech was distinct and natural, and I noticed no issues related to edginess or intelligibility. Music seemed a bit lackluster but offered acceptable range and vibrancy. Effects were also accurate and fairly concise, though bass response never came across as anything better than okay. That went for the whole track, as it consistently seemed decent but unexceptional. Muppet provides a few minor extras. We open with a featurette called Inside Pepe’s Studio. This 19-minute and 50-second program gives us an amusingly tongue-in-cheek documentary about the flick. It emulates the Inside the Actors Studio show as Pepe the King Prawn interviews director Kirk Thatcher. This platform then allows for some clips from the set and on-the-fly soundbites from Whoopi Goldberg, David Arquette, Joan Cusack, Fozzie, Miss Piggy, and Kermit. It’s not a very revealing piece, and it depends too much on clips from the movie. Still, it’s funnier than most and offers some decent entertainment as well as fun behind the scenes shots. Heck, it’s worth a look if just to see how goofy Thatcher looked in the late Eighties and to hear Pepe mock him. Next we get a collection of Bloopers. Via the “Play All” option, these run a total of five minutes, 25 seconds. I normally don’t care for these sorts of outtakes, but inside the Muppet framework, they become much funnier. The performers offer some great ad-libs and the clips seem quite amusing. We follow this with eight Deleted Scenes. They run a total of seven minutes and two seconds. A couple of minor funny moments appear, but overall the cut shots deserved to be omitted. In the Muppet Bios area, we get some text about those characters. This domain presents tongue-in-cheek information about Kermit, Miss Piggy, Fozzie Bear, The Great Gonzo, and Pepe. It’s a moderately fun little extra. A few bits round out the disc. We get trailers for Good Boy, Just For Kicks and the Muppets Party Cruise videogame. In addition, “Fun Holiday Previews” and “Family Fun Previews” presents ads for eight MGM releases. Lastly, we find an Easter egg. Click up from “Scene Selections” to highlight “Merry”. Hit “enter” to watch a 64-second deleted scene that features director Thatcher and voice actor Bill Barretta. It’s moderately entertaining. No one will mistake It’s a Very Merry Muppet Christmas Movie for a holiday classic. However, despite the flick’s erratic portions, it seems generally entertaining and improves as it progresses. The DVD presents excellent picture along with fairly average audio and a modest but mostly interesting set of extras. Muppet isn’t a great Christmas film, but it’s not a bad candidate for family viewing.